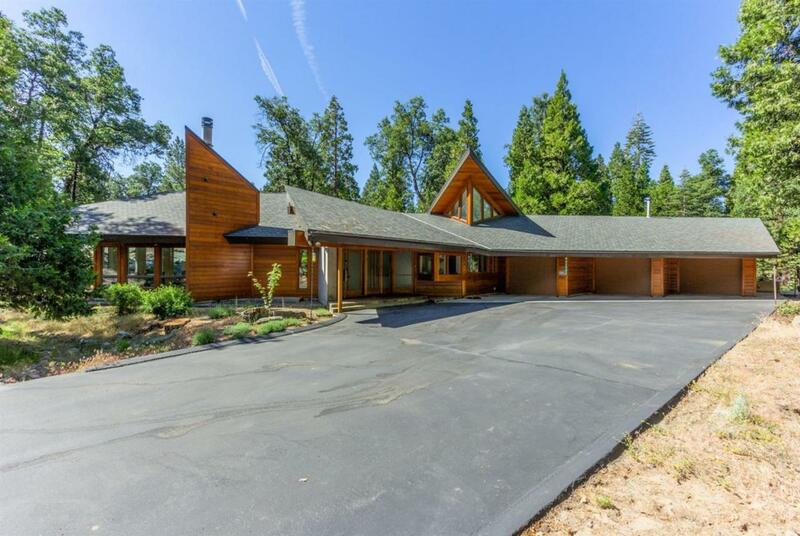 This spectacular single level 4/3 mountain home in the prestigious Granite Ridge sub of Shaver Lake. Featured on the cover of Fresno Magazine, the residence was designed by world famous architect Art Dyson. Dyson is currently Dean Emeritus at the Frank Lloyd Wright School of Architecture where he studied under Mr. Wright back in the 50's.The home is a perfect combination of modern architecture, natural organic materials(walnut flooring and custom walnut entry doors & clear cedar exterior)thoughtfully placed on a acre lot, natural rock garden, cedar and oak tree setting. The large floor to ceiling windows bring the beauty of the outside in. The exterior deck has recently been resurfaced with the low maintenance TREX material. The 3 car garage has room for all your toys plus it is street level. The property is heated with central heat, 2 fireplaces(1 in the LR and the other in the Master),+ radiant heating in the floors & AC. This is a unique and special opportunity. Appt only. Cross Street Address Granite Ridge Rd.